Cops are asking for the public’s help in identifying a man who stepped behind the counter of a Lincoln Square fragrance store and tried to attack a female worker. Just before 3 o’clock on Thursday, the man entered the shop in the 4800 block of North Western and asked the 26-year-old employee a series of potential gifts for his girlfriend. As the woman returned to the service counter, the man said something to the effect of “I have to do this” and then barged behind the counter and charged at the victim, police said. The woman was able to escape and the offender fled the scene. Police said the suspect is a Hispanic man 35-45 years old, about 6’1” tall, and 250-280 pounds. He was wearing a maroon-colored Blackhawks hat, a dark t-shirt, dark jeans and black Timberland-style shoes. 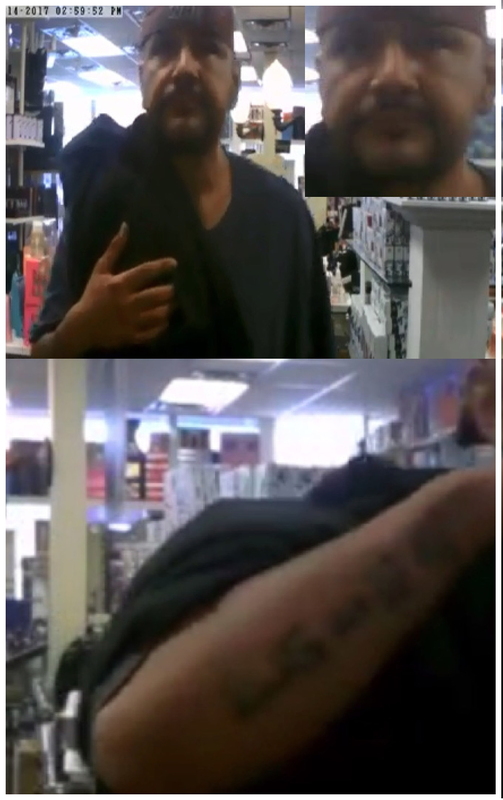 Video surveillance images show several tattoos on on the man’s lower right arm. Anyone with information about the suspect is asked to call Area North Bureau of Detectives at (312) 744-8200.